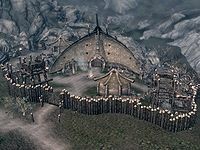 Dushnikh Yal is a prosperous Orc stronghold located southeast of Markarth and southwest of Karthspire. In the cellar found inside Burguk's Longhouse you can find a unique item: a Dragonfly in a Jar. This page was last modified on 27 May 2018, at 01:20.